Remember that city in Japan that created a Pikachu ripoff? Sure you do! Kotaku posted about it yesterday. Is This a Pikachu Ripoff? The character Eco-chan opened an environmental center in Japan's Yamaguchi Prefecture and was supposed to be used in green publicity campaigns. 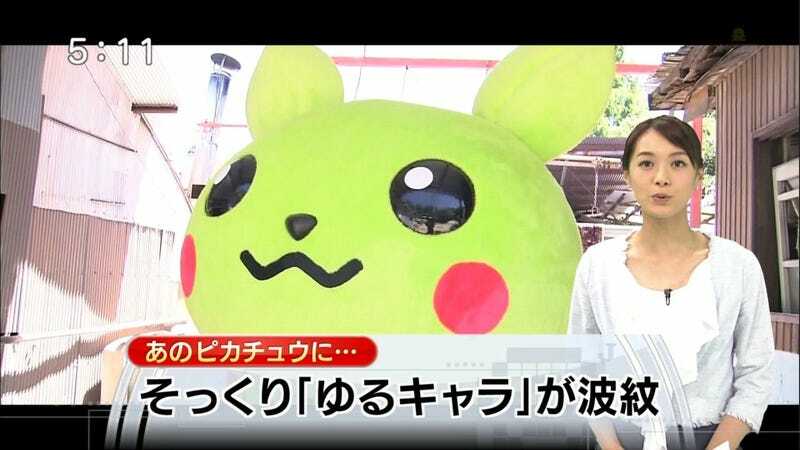 According to Japanese news reports, it was only after the character's costume was complete that a city staffer said that it looked like Pikachu. Moreover, the person who did the original illustration apparently had never heard of Pikachu. That person also lives in a cave with no electricity, television, and has never been to a supermarket in Japan. Pika-whut? Clean up on aisle six! Japanese supermarkets are awash with gaming-related food and snacks. The individual in charge at Yamaguchi Prefecture told Sankei News that he thought the original illustration was different from Pikachu, adding, "I didn't think this was a copyright problem." The city is currently considering what to do regarding the character that ended up looking like Pikachu.